As Ainley had resigned his commission and was no longer in the Army at the time of his death, he is not recognised as a war death for the purposes of the CWGC. To many of our readers especially in St Paul's district, the Rev WP Ainley will be remembered as a former curate at St Paul's where he laboured for a for about 2 years and left last year with the intention of proceeding to the Mission Field in China. The outbreak of the war led to a change in his plans and Mr Ainley became an Army chaplain at Aldershot, where he unfortunately contracted spotted fever. He lay in a prostrate condition being affected mentally as well as physically but a change for the better came and it was hoped that the Rev gentleman would pull through. A change for the worse, however, set in and Mr Ainley passed on Wednesday. The sad news was conveyed to his father , the Rev FW Ainley, vicar of Uffington, Lincs, who at the time was at Bath taking part in a series of devotional meetings. The Rev Ainley was a much liked during his curacy at St Paul’s where he laboured with much acceptance and when he left the esteem of the parishioners was expressed in a presentation being made to him. The Rev gentleman was a keen supporter of the missionary work and he stated before leaving St Paul’s that his missionary spirit was intensified at an exhibition held in Chippenham about 3 years ago and it was this then that he made the resolve to go to China, a resolve which death has now prevented being put into practice and all will regret the cutting short of a promising career. 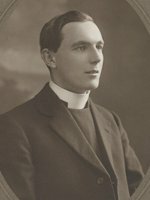 The Reverend W. P. Ainley, temporary Chaplain to the Forces, 4th Class, relinquishes his commission on account of ill health. Dated 10th September, 1915. There is a Chaplain 4th Class Frederick William Ainley recorded by the CWGC as having died on 5th December 1918, buried in Terlincthun British Cemetery, France and is commemorated on the memorial at Tydd St Mary in Lincolnshire. This, I believe to be his brother, Frederick W Ainley.